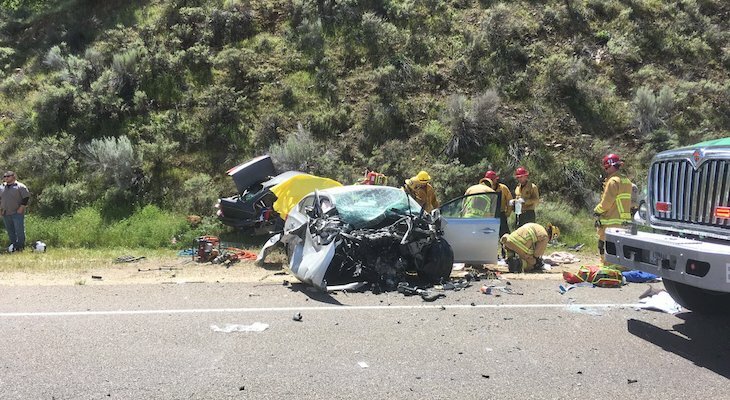 At 12:34 p.m., Santa Barbara County Firefighters responded 3 miles west of Rock Front Ranch in Cuyama with ground ambulances, a Calstar helicopter, and California Highway Patrol (CHP). Upon arrival crews found a head-on collision between two vehicles that sustained heavy damage. There was a total of five patients between the two vehicles, two were pronounced dead on arrival. Two other patients sustained serious injuries while one patient sustained moderate injuries. The three patients were extricated and transported to local hospitals, one via Calstar helicopter and two via ground ambulance. CHP had Highway 166 closed while the CalStar helicopter landed and officers did an investigation. Highway 166 at Rock Front Ranch...Fire Department, Medics, SBSO, CHP on scene Cal Star responding. Possible Double Fatal, One Critical, One with minor injuries.